As the premier event showcasing sustainable development, Luxe Pack in green Shanghai 2017 Awards Ceremony was successfully held on Wednesday, April 12th, 2017. 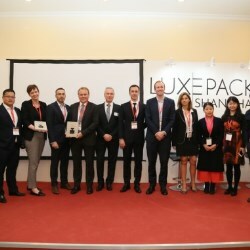 A prestigious jury panel of industry thought leaders awarded two Luxe Pack in green prizes: one to the best eco-friendly designed packaging solutions and one to the most responsible initiatives, submitted by 2017 Luxe Pack Shanghai exhibitors. 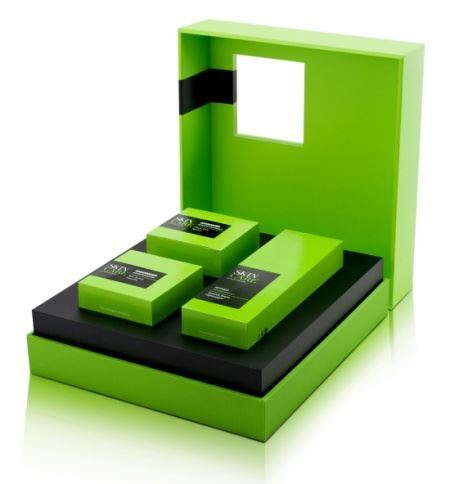 MESTÄ BOARD won the Luxe Pack in green Award in the Packaging Solution category, with its MESTÄ SKINCARE GIFT BOX. This prize recognizes new eco-friendly designed product with a specific positive environmental and sustainable impact. MESTÄ SKINCARE GIFT BOX was designed to promote sustainability while providing a unique user experience. It’s Light-weighting, convenient for recycling with a unique one-step opening and closing mechanism. Cyril Drouet, Design & Innovation Director and Petri Jantunen, Vice-President, Sales APAC at Metsa Board received the trophy designed by Nianxiang Design Agency. As far as the responsible initiatives category is concerned, JAMES CROPPER won the Luxe Pack in green Award, with its Burneside Community Energy initiative. This prize recognizes internal responsible sustainable initiatives conducted by the company. 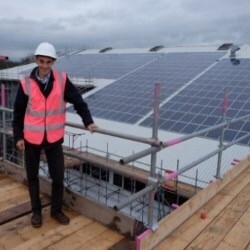 The installation of a 250KW Solar PV Array with Burneside Community Energy to help generate clean, green electricity in a way that doesn’t compromise the special ecology or superb landscape of Burneside or that of Cumbria. Susan Wilson, Luxury Packaging Director at James Cropper, reported the whole team will be very proud for this award winning. 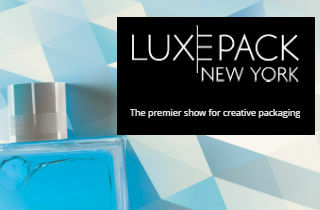 Reserved for exhibitors, the Luxe Pack in green Awards, which throw the spotlight on the most environmentally-friendly packaging solutions, has become in just a few years the benchmark event at Monaco, New York and Shanghai. A true showcase of progress in terms of eco-design, as well as for CSR initiatives among the exhibiting companies, these Awards acknowledge the expectations of an entire profession. Luxe Pack Shanghai 2018 will take place from April 11-12 at the Shanghai Exhibition Center. Full success for Luxe Pack Shanghai in green sessions! For the 1st time, LUXE PACK SHANGHAI has offered its exhibitors and prospects, training sessions on sustainable development and on LUXE PACK in green Awards. Taking place in Shanghai and Shenzhen late October, they encountered a full success with large attendance in both cities! The interest for sustainable development of both suppliers and brands is booming in China and LUXE PACK SHANGHAI is the first and unique show to answer to these new requirements from the luxury sector. LUXE PACK SHANGHAI 2017: THE BEST EDITION EVER! LUXE PACK SHANGHAI 2017 was concluded with historic heights after two days of innovative display, nourishing programme and business exchanges.The event welcomed 4284 visitors from 41 countries, up 10% versus 2016; the show gathered 200 exhibitors from 12 countries. LUXE PACK SHANGHAI 2017: This remarkable 10th edition will take things to the next level! For its 10th edition that will take place on April 12 & 13, 2017 at Shanghai Exhibition Center, LUXE PACK SHANGHAI will undoubtedly take things to the next level! For its 10th edition that will take place on April 12 & 13, 2017 at Shanghai Exhibition Center, Luxe Pack Shanghai will undoubtedly take things to the next level! It is a remarkable event dedicated to creative packaging that has made its mark as the market reference trade fair, at the forefront of trends and innovations. Luxe Pack Shanghai, the premier show for creative packaging in Asia, renews its collaboration with design agency CENTDEGRES for a new inspiring Luxe Pack trends incubator by centdegrés, on the occasion of its 10th edition. Luxe Pack Shanghai 2017: Committed to innovation for 10 years plus "culture allied to new technologies"
As an international benchmark for creative packaging, and an unparalleled showcase for creativity, design and innovation, Luxe Pack Shanghai will celebrate its 10th anniversary on April 12&13, 2017, at Shanghai Exhibition Centre. Packaging innovation has always been at the show’s forefront, and this year is no exception! Luxe Pack Shanghai, the only live platform that really promotes creative packaging in Asia, will celebrate its 10th anniversary from 12 to 13 April 2017 at Shanghai Exhibition Centre. With 30 years of experience in Monaco, Shanghai and New York and a real network throughout the world 3 times a year, Luxe Pack Shanghai has become the most acclaimed event for creative packaging industry. Luxe Pack Shanghai 2019: why visit and exhibit?